Astonishing, flavored coffee, with a bitter taste, you can successfully combine with a variety of snacks, flour and sweet dishes, pastries, cakes and pies. And what else drink coffee, that offer coffee around the world? That will be served with coffee, depending on the event, scheduled. For business events require one approach, for a friendly party - slightly different, and called for pryema - Third. In different countries have their own traditions, but, in Russia some clear framework on this point. The most simple - do not forget to submit it to the coffee sugar (better than refined sugar cubes), if necessary, milk or cream. can say, that is the minimum program, suitable for business meetings. Some offer coffee and finely chopped lemon slices, they are served on a plate with a special separate fork. In the extended embodiment, coffee can also offer candies, biscuit, cakes, pastries, muffins, ice cream. 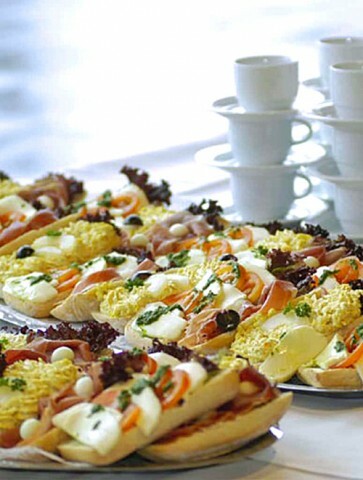 At the reception the coffee combined with good buffet, preparing small canapés with various fillings, sandwiches a couple of bites, cold and hot snacks, eg, white chicken meat, Vol au vent with tuna, omelets. And, taking into account the preferences of the guests, Cheese of different grades, nuts, salads, smoothies, fruits (oranges, bananas, peaches), chocolate. Besides, coffee is served alcoholic beverages: balms, liqueurs, rum, brandy, etc.. In this case, the dishes for them, namely special glasses or wine glasses, offered separately, because alcohol is not poured into the coffee, and drink, alternating with them. Additionally put juices, icewater, mineral water, to take into account any wishes of the guests. 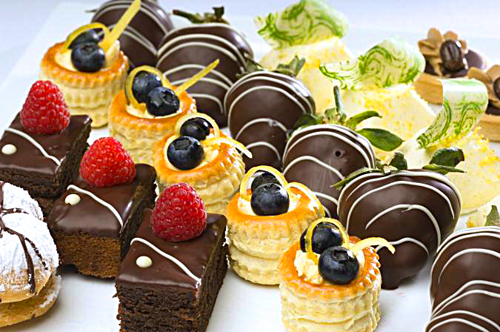 Coffee blends perfectly with any desserts - they want, puddings, cream, sweet casserole, trigon, any confectionery and bakery products. For friends can be arranged original coffee evening, if you show a little imagination, and place it, eg, in Arabic, Belgian, Indian, Italian or any other style, using national rules coffee ceremony, giving coffee the traditional dishes of any country. First of all, you can experiment with coffee preparation, because the peoples of the world do coffee recipes have their secrets. There are some interesting its variants, as the Viennese coffee, coffee by-turecki, Greek coffee, in German, in Italian, per-Brazilian, options - thousands, has something to surprise friends. Coffee pm Arabic style, according to the recipes, preparing thick, strong, very fragrant. During cooking, guest's request, spices can be added: cardamom, cover, carnation, saffron. For coffee fed icewater, various fruits, such as figs, dates, grapes, delicious oriental sweets with honey and nuts. A sip of coffee combined with a sip of water, to better discover the taste and aroma of the drink. The Belgians and the Swiss I love to drink coffee with chocolate, vprikusku, or adding a drink. Often snack cheese, omelette, add milk, use juice, liqueurs, copper. French people I love to drink coffee with milk, croissants, toast with jam, with juices. Austria famous for its coffee shops with original recipes of Viennese coffee and Viennese pastries amazing to him, cakes, cakes, all kinds of cookies, rolls and cakes. In Australia coffee served milk, cream, acidified water, pastries, but without cream - donuts, crackers, different varieties of cookies. In Germany to prefer coffee biscuits, but with spices and herbs, Takima how cardamom, carnation, ginger, cinnamon etc..
Now, knowing, that is fed to the coffee, you can choose, that to taste, and invite friends for a cup of coffee. Enjoy coffee in the evening!